Cycling Alpe d'Huez region: your ultimate guide (inc GPX, maps + more)! The French Alps are the motherland for many road cyclists. They are home to the iconic climbs you see on TV and magazine centrefolds. They are synonymous with legendary climbs, unbelievable feats of endurance, crowd filled roads, the brightly coloured peloton and the circus that is the Tour de France. Of all the Alpine big hitters, one name is more famous than any other: Alpe d’Huez. If you love cycling, cycling Alpe d’Huez is one you just have to do. And while you’re in the area, why not pit yourself against the other big names: the Galibier, Glandon and Croix de Fer to name a few. If you’re looking for French Alps cycling and want to feel close to cycling legend and get a taste of the suffering, pain and glory, this is the place to come. 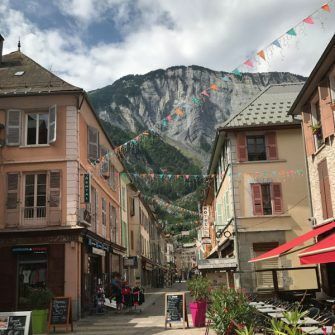 In this guide you’ll find information on rides, accommodation and bike hire that’s all accessible from charming Bourg d’Oisans. The town sits at the base of Alpe d’Huez and close to Col du Glandon, Col de la Croix de Fer, Col de Sarenne and Col du Galibier. Col de l’Iseran (and surrounds) covers the Isère Valley, including climbs such as the Col d’Iseran and Cormet de Roseland. Provence and Ventoux covers Mont Ventoux and the beautiful Luberon hills. Nice covers the unmissable climbs of the southern Alps close to the Côte d'Azure. Planning some cycling in the Alps? Drop us a line; we’d love to hear from you! The challenge in the French Alps is not finding rides (there are so many!) but finding the best ride for you, the one you'll never forget. So, what motivates you? The famous Alpine cols? The best Alpine cycling climbs? The most epic landscapes? The hidden gem? Pushing yourself to the limit or taking time to enjoy the scenery? We’ve got routes that tick all these boxes, including some of the best climbs in the Alps, all within easy access of charming Bourg d’Oisans. This area isn’t ideal for family cycling, especially with young children. It’s difficult to avoid the mountains and valley rides are along a main road. Older children who are confident cyclists may be able to tackle some of the less ferocious routes mentioned above, perhaps La Bérarde after St-Christophe-en-Oisans or the Col de Ornon. But take it easy. You don’t want to put them off! The rides in this guide are grouped around Bourg d’Oisans. This is where we stayed, and we think it’s one of the best towns in the Alps for excellent riding. From Bourg d’Oisans you’ll find the following rides within easy reach: Alpe d’Huez, Col du Glandon (south side), Col de la Croix de Fer (south side), Col de Sarenne and Col du Galibier. Chalet Ribot is a 300 year old farmhouse perched in a tiny hamlet half way up Alpe d’Huez. It’s a spectacular location with far-reaching views over the valley. The steps up to the house pass dilapidated buildings - but once through the gate, there’s a warm welcome from Letty, Harun and Denzil (the Bernes mountain dog) and you know all will be well. For us, this was a truly special place to stay. How much Letty and Harun care. Letty is super helpful with bike ride planning, from which mountain tunnels are lit (for those that may have forgotten their bike lights…) to offering her opinion on the most exceptional routes. She also goes out of her way to ensure you have a wonderful stay. After a day out she was usually on hand on our return to ask how it was and offer a drink. She provided us with a cot and highchair, daily housekeeping and washed and dried our clothes too. Food. 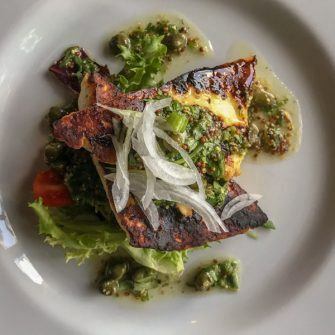 Harun is passionate about food and our evening meals were truly excellent. He also cooked a 6 pm tea for the children, which worked brilliantly as it meant the children were in bed while the adults ate at 8 pm. Our son happened to mention his favourite food was pizza - and guess what appeared on the table the following night. We also enjoyed the complimentary Nespresso available in our rooms and the living room! Service with a smile. Back to Letty and Harun again! Nothing is too much trouble. We asked for the children’s tea to be served at a different time each night and were late twice! They may have been seething behind the scenes, but seemed totally relaxed. Relaxed vibe. The vaulted ceilings of the living/dining room give a cosy, homely feel which is complemented by the honesty box in the well-stocked bar. Excellent bike garage and wash down area. These cycling friendly facilities are no passing gesture, there’s everything a cyclist might need. You can even buy extra gels, inner tubes etc. at a very reasonable price. Lap pool, jacuzzi and sauna. The lap pool is ideal for young children that want to splash around. The facilities are also excellent for adults and with the lovely sun deck too, there’s enough for a non-cyclist that wants to spend a morning/afternoon relaxing while their partner is cycling. Location at bend 12 of Alpe d’Huez. This could be a positive or negative depending on your perspective. Not being in the centre of a town has its drawbacks, as does having to cycle halfway up a mountain at the end of a ride. On the other hand, you get to know cycling’s most famous mountain, you get superb views, you’re in an excellent position to ride routes you might not otherwise get around to (for example the Pas de la Confession loop), and you’ll undoubtedly be a better climber by the end of a stay! Comfortable rather than super smart. Come with that expectation and you won’t be disappointed. A short walk to the car park. 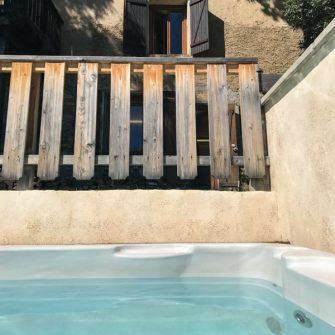 Chalet Ribot is not a good choice for anyone that doesn’t like steps; there are a couple of flights up from the road​ to the chalet, and more from the chalet to the bedrooms. That said, our 1.5 year old was fine. We felt very well looked after and thoroughly at home throughout our stay at Chalet Ribot. 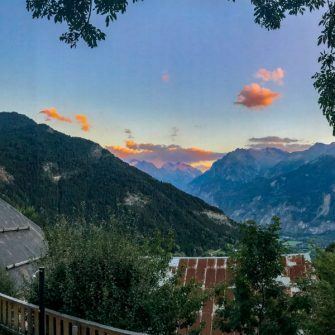 Letty and Harun were charming hosts and a major part of the reason we’d recommend Chalet Ribot to anyone looking for cycling accommodation in the French Alps. There’s a lot of accommodation suitable for cyclists in and around Bourg d’Oisans, but we found it hard to find many places up to Epic Road Rides standards! Notable exceptions are where we stayed (of course) and the three B&Bs on our long list: Chalet Saskia, Chateau d’Oz and Chalet Morville. A beautiful ski chalet in the small, pretty village of Vaujany, about 19km north of Bourg d’Oisans. It’s halfway up the Col Sabot (on the way to the Col du Glandon from the south) - but they say they will come and pick you up at the bottom of the mountain if your cycling legs have given way! East and a west wing both sleeping 10-13 people. They have family rooms. Offers bed and breakfast and six days a week you can also have afternoon tea and dinner. The chef’s food is a highlight. Sunny terrace with great views, a spa with hot tub and sauna. Washer and dryer and daily housekeeping. Games room to keep kids (and grown-up kids) amused: table tennis, bar football, board games, toys. 200m from Vaujany’s excellent leisure centre with swimming and gym complex, ice skating rink and bowling centre. Bike garage with work station, pumps and tools. Chateau d’Oz is in Oz en Oisans, about 14km north of Bourg d’Oisans and well placed for the major climbs of the area. 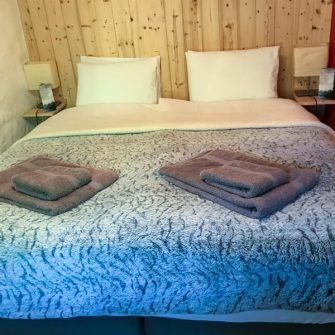 Probably the most simple accommodation in our list of suggestions, but it makes up for that with good facilities, well-sized bedrooms and kitchenettes for those that might want them. Breakfast and evening dinner are available on request. You’ll find your hosts knowledgeable on the best routes in the area. Games room with children’s toys. Well-equipped, locked garage for bike storage and maintenance. 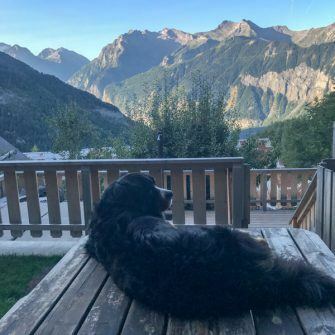 One of the more luxurious options, Chalet Morville is in the medieval village of Venosc about 15 km south-east of Bourg d’Oisans, on the road towards the Col du Lautaret and Galibier. The chalet is in the village, with shops, bars and restaurants within a couple of minutes walk of the chalet. It has smart decor, five large bedrooms, daily housekeeping and impressive facilities: a drying room, fitness and massage room, games room with pool and table football. There’s also a cinema room, and they can provide childcare equipment including cot, high chair, baby monitor and stair gate. Outside, there’s a terrace, hot tub and sauna. Food is top notch, with breakfast, cyclists’ tea and dinner all available. There’s an honesty bar, and they also offer separate children’s evening meals. 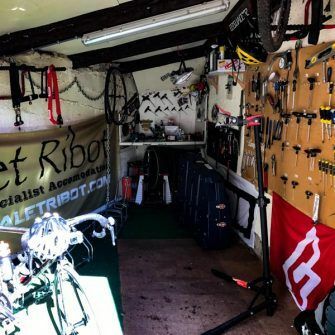 The bike storage room is well kitted out, with bike stands, track pumps and plenty of tools. 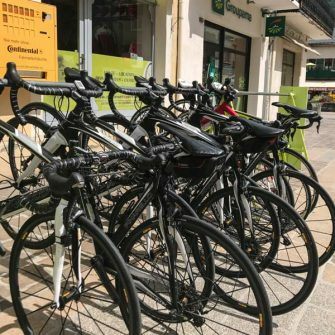 There are plenty of options for road bike hire around Alpe d’Huez, both in Bourg d’Oisans at the base of Alpe d’Huez and in the village at the top of the mountain. Cycles et Sport is the most prominent name you’ll see in Bourg d’Oisans, though our hosts at Chalet Ribot recommended Cycle Huez over Cycles et Sport. 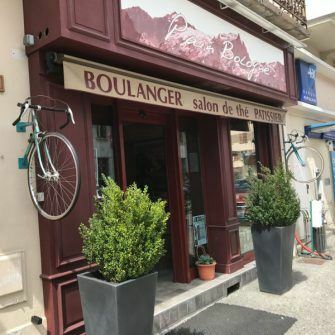 Even the boulangerie is pro-bike in Bourg d'Oisans! We didn’t need to hire on this trip so can’t say either way. It will probably come down to whichever is more convenient for where you’re staying. A good variety of bikes from BMC, Scott and Specialized to Pinarello F8 Dura-Ace and Dogma 65.1. You can also stock up on kit, energy food and there is a repair shop too. From 39-90€ per day, depending on the bike. A small shop in town. Their website is poor. Has a selection of 36 bikes of different sizes and qualities to meet most needs. Wilier GTR 2017/2018, carbon, shimano ultgra compact groupset, 11-22 cassette. 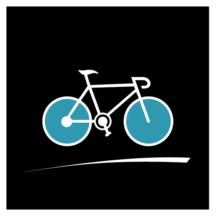 Bikes are supplied with a saddle bag containing a spare tube and tyre levers, a pump mounted on the frame. All have two bottle cages (except the XXS frames). Also provides bike servicing and repairs. Lapiere Sensium 500, carbon bikes. Also has mountaineering and other equipment rentals, as well as sports and fashion items for sale. Take a look at our five questions you should ask before hiring a bike. Our ultimate packing list may also help. Read our article, Cycling in the Alps: when to go for full details. For an awe-inspiring sense of the history and grandeur of the mountains, take a look at Friebe and Goding’s Mountain High and Mountain Higher. We've reviewed Mountain High, here. Cycling the French Alps (and Alpe d’Huez in particular) is demanding and should not be underestimated. Read our cycling Alpe d’Huez tips before you go. The Alps fall into eight different countries: France, Austria, Germany, Italy, Switzerland, Slovenia, Liechtenstein and Monaco. Want more? Don’t miss our guides to the best cycling routes in the Alps and other articles on the French Alps, below. Top tips for a successful trip to the Alps: these are the things you need to know before you go! A practical, cycling focused guide on when to cycle the French Alps from a weather perspective. It includes the 4 things you need to consider before you book and an at-a-glance weather table. Our must-read guide to the unforgettable ride to Saint-Christophe-en-Oisans and La Bérarde. Locals call it the end-of-the-world and you'll see why. Our essential ride guide to an easier, but still stunning, ride in the Alpe d'Huez region. Read on for map, profile and GPX. Our indispensable ride guide to tackling the legendary Croix de Fer and Col du Glandon from Bourg d'Oisans. We tell you what you need to know for a ride you won't forget. Our ultimate ride guide to tackling the mythical Lauteret and Galibier from the south. You'll find everything you need to plan an awesome ride.